I was born 23rd of October 1913 a bit farther along this street and after I got married we had this house built, it was somebody’s allotment, so I’ve lived here all my life. I think I was three when I started at Newton Road Infants School then, possibly when I was eight, I went to the senior part of the school under Mr Perkins. I failed the eleven plus with a lot of other people and went to Rushden Intermediate School. I’ve got a picture of it taken in 1927 just before I left. When I left I could do logarithms, trigonometry and French. I loved French, really loved it. We learned the Parables and the 23rd Psalm in French and a poem ‘L’Hirondelle’, the swallow. I can still get through that now after 79 years. 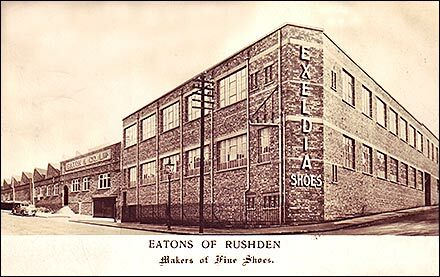 I left school at fourteen and looked around and there were shoe factories in every other street. Eventually I started worked at John Whiteâ€™s because he had been an ordinary shoe worker until he started his own business and he had a lot of foresight and believed in piecework. The agreed day work rate for school leavers at fourteen was 10 shillings (50 pence) a week and we did 48 hours for that. I was on staple side-lasting and I used to have to â€˜draft the stitchesâ€™, use pinchers and pull the seats over and put the tack in, then staple the side. John White started making welted footwear, his first thirty odd years heâ€™d done just ordinary shoe work, what we called tack work â€“ while welted was doing mechanically what had been the traditional, hand sewn method. They took my machine up to the new factory in Lime Street; we still worked in teams but werenâ€™t doing much so we was standing about a lot. I think we were getting thruppence three farthings where weâ€™d been getting five pence an hour. I stuck it for two or three weeks then Eatons advertised for a staple side-laster. My brother worked there and he told me at dinner time that as long as I gave in my notice before I finished work they had to accept it, so I did. I went up to Eatons and I liked it up there. I got on alright on the same job and they made just a slightly higher grade of footwear than John Whiteâ€™s â€“ mind you, his shoes were marvellous value for money and thatâ€™s why he prospered. When the war came I didn’t go in the forces straight away ‘cos they had to change to a lot of army government work. The equivalent job of staple side-lasting was console lasting. I wondered what the console was till I saw on one of the doings that had got a ’Consolidated Hand Method Lasting Machine’. You put packets of tacks in a box at the . . . and every time you used it the box was going round the tacks used to come down the slide and they got what we called a ‘tack finger’ that went in and sorted them out  marvellous machine and they were getting on for a hundred years old - you know the design. After the war started you couldn’t leave to go to another factory, you had to get permission. It got a bit hard because you were working in the daytime and you took your turn in night watching. You had to pop up at 10 o’clock, walk round the factory once every hour till 6 in the morning so it was very tiring. When I came out of the forces I went back to Eatons and I had my old job of staple lasting. After a while another job came up and I was sort of promoted to toe-lasting - number eight toe-laster. I worked on a machine that shaped  forced the uppers  at the toe end and it was highly skilled. In time study it was a Grade A job. If you didn’t put enough pressure and just right there were wrinkles which you had to get out. Then, eventually another job came up  the pull-over  so I worked on the number eight pull-over then. I won’t say I was better than anybody else but I was sample side-stapler and sample toe-laster. 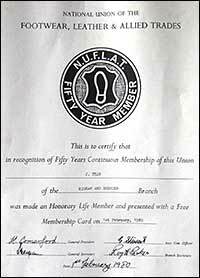 On February 1st 1980 Jack Tear was made an Honorary Life Member of NUFLAT in "recognition of Fifty Years Continuous Membership of this Union"